Aunque se trata de un congreso más enfocado a ingenieros e investigadores con grado de doctor el tema central es tan nuestro que deberíamos prestarle atención a los resultados de lo expuesto allí. Trataré de subir al blog algunos vídeos y fotografías. Insisito en que aunque esto parezca muy lejano para un clínico es un campo de futuro para nuestra especialidad que no debemos perder de vista si pretendemos seguir trabajando durante los próximos diez años. (The lecturers below are confirmed; additional lecturers will be added, schedule subject to change ) . The school instructors are experts in robotics and assistive systems and medical experts that use these systems in the medical practice. Returned to native Italy in 2000, after spending 15 years at NASA-JPL in USA, Professor Fiorini cumulates almost 30 years of passioned discovery and development work in robotics. He has brought important contributions in robotic manipulation, human-robot interfaces, teleoperation,motion planning in dynamic environments, planetary exploration, coordination of mobile robots, service robotics, etc. Prof Fiorini is leading research projects in various areas including medical robotics AccuRobAs, Virtual Abdomen, Haptics, cognitive robotics (Xpero), robot standards (RoSta, Penelope, etc. He has organized and chaired or co-chaired numerous conference and workshops, and an IEEE RAS robotic summer school. Robot mobility systems, navigation and control With over 20 years in robotics, out of which 18 years at NASA-JPL, Dr. Eddie Tunstel is since 2008 the Space Robotics & Autonomus Control Lead at the Applied Physics Laboratory. At JPL Eddie directed robotics technology developments in manipulation and mobility, developed autonomous control and navigation algorithms, software, and systems for planetary rover research and flight projects. He was Lead Systems Engineer for the Field Integrated Design and Operations (FIDO) rover technology task. He was actively involed in developing robotic technologies for Mars missions, as JPL PI/Task Manager for distributed science instrument system mobility and surveying, provided Robotics Space Exploration Technology Program management assistance, while for the 2003 Mars Exploration Rovers (MER) flight mission he served as a Flight Systems Engineer specializing in surface mobility & autonomous navigation, and the surface operations Spacecraft/Rover Engineering Team as Lead of its mobility and robotic arm sub-element. Eddie has edited 3 books in robotics. He is actively involved in professional activities and editorial activities. He is Society Vice-President of Conferences and Meetings for the IEEE Systems Man and Cybernetics. Professor Rovetta has had a distingushed career in innovation across a broad range of fields. In particular relevant to this meeting is his pionering role in robotic (tele)surgery, having performed the first transatlantic teleoperation in 1993 and the first telerobotic surgery on a patient in 1995. To cite from the History of Robotic Surgery (by HM Satava, Prof of Surgery at Yale, "in 1993, Alberto Rovetta(15) was able to successfully perform a liver biopsy on a pig liver with the surgeon's station being at the NASA Jet Propulsion Lab (JPL) in Pasadena, CA and the manipulators and pig liver in his laboratory in Milan". Prof. Rovetta has obtained numerous international and national patents, such as patents related to (here one mentions only those related to medical robotics): lower limb prosthesis, mechanical hand for robots (in conjunction with Alfa Romeo), robotic dummy for heart surgery,sensor for prosthesis of lower limb, system Daphne and Vrepar for the neuromotor analysis for Parkinson disease (with ST Microelectronics), prosthesis of inferior limb with intelligent control, and many others. He has published over 400 articles, is author of many robotics books and is a member of many prestieous organizations including the New York Academy of Sciences. Some of his executive roles include Executive Councillor of the International Federation for Theory of Machines and Mechanisms (IFToMM), President of the International Committee in within UITA-Unesco for Advanced Technologies, Past President of SINT (International Society of Theoretical Neurobiology). Computer integrated surgery Professor Jos Vander Sloten is Chair, Division of Biomechanics and Engineering Design of at K.U.Leuven. As research assistant and post-doctoral researcher he specialzed in musculoskeletal biomechanics. He is programme director of the Master of Biomedical Engineering. His research interests are computer applications in musculoskeletal biomechanics and computer integrated surgery. Professor Vander Slotten has extensive professional involvement, including as a Member of the Editorial Board for Journal of Engineering in Medicine, Computer Methods in Biomechanics and Biomedical Engineering, Biocybernetics and Biomedical Engineering, and other. He is also reviewer for Technology and Health Care, IEEE Transactions on Biological and Medical Engineering, Journal of Engineering in Medicine, Journal of Biomechanics, Clinical Biomechanics, and various research bodies such as the European Commission (Craft/Biomed, STSC, Quality of Life).Between 1997 and 2003 he served as Secretary-General ESEM (European Society for Engineering and Medicine). He is member of the council of the Belgian Society for Medical and Biological Engineering and Computing, and of the European Society of Biomechanics. In the European Alliance for Medical and Biological Engineering and Science (EAMBES) he served as secretary-general (2003-2004) and president-elect (2005) and president (2006). Dr Frédéric Colledani is with the French Atomic Energy Commission (CEA), software intensive department (LIST), in the Interactive Robotics Unit, where he is responsible for the cobotics research area. 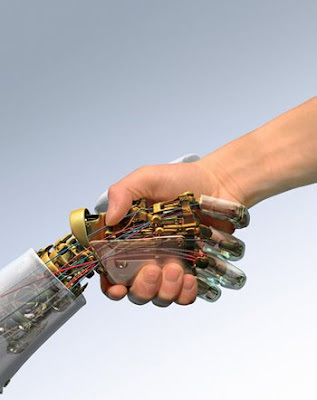 Cobotics is the research area where man and robot are working together on the same task in the same working space. Dr Colledani is especially concerned by high performance robust control, intuitive man - machine interface and user safety. Two of his CEA projects are in medical robotics: the BRAHMA project, part of which a robotic exoskeleton is designed for upper-limb rehabilitation, and the SURGICOBOT project, in which a small robot (a haptic interface by Haption) is used to hold a drill simultaneously with the surgeon, to provide virtual guides, tremor filtering, etc. Dr Frédéric Colledani has a PhD in control science (1995) from University of Paris. He has spent 12 years at Peugeot-Citroën as scientific team leader in a variety of applications while having a continuous active research on easy-to-use man- machine interfaces, control performance and user safety. As an inventor, he has more than 10 patents in vehicle and robot control. Dr Adrian Lobontiu is surgeon at Henri Mondor Hospital, Paris 12 University, France in the Cardio-Thoracic and Vascular Surgery Department, in charge for Robotic Tele-Surgery and Minimally – Invasive procedures. He is also Director of the European Physician Education at EndoGastric Solutions, Inc. a privately held corporation, located in Redmond, Washington, USA, pioneer in endoluminal, incision-less surgery for the treatment of upper gastrointestinal diseases, including gastroesophageal reflux disease (GERD) and obesity, where he trains and demonstrates surgery techniques in Europe. Prior to join EndoGastric Solutions, Inc., Dr Lobontiu was Clinical Manager, Europe for the California, USA - based Intuitive Surgical Inc., today’s world leader in surgical robots (NASDAQ - ISRG) where he introduced a revolutionary technology in Europe, obtained CE mark before FDA approval and initiated the world’s first robotic surgical procedures (European results leveraged to raise 80 MUS$ in company’s IPO). He established key direct contacts by training top surgeons in following specialties: cardiac, urology, general surgery and vascular surgery and demonstrated robotic surgery techniques in Europe and USA. Dr Lobontiu held the Director position for the Robotic Surgery Module at the European School of Surgery in Paris. He teaches the Master of Biomedical Engineering of Health at the University of Medicine René Descartes, Paris – France and the DIU (Diplôme Inter Universitaire) of Robotic Surgery at Jussieu University in Paris. Dr Lobontiu is member of the SAGES (Society of American Gastrointestinal and Endoscopic Surgeons), CATEL (Club des Acteurs de la Télémédicine – France) and of the “l’Amicale” of Surgeons of the European Hospital Georges Pompidou in Paris. Dr Lobontiu was nominated "International Health Professional of the Year 2006" by the International Biographic Centre, Cambridge, England. He is internationally published and invited speaker at International Conferences and Congresses for innovative surgical techniques. Author and co-author of 12 monographs and over 200 scientific works and papers presented and published at meetings, conferences and orthopaedic publications. International training at top orthopaedic surgery institutions in France, Austria, USA, Germany, Belgium, etc. Member of numerous scientific orthopaedic societies in Romania (ATOM, SOROT, ASORIS) and abroad (SOFCOT, EFORT, AOLF, SICOT, AAOS). Robotics lab Michael Newell is a Senior Member of Technical Staff at NASA's Jet Propulsion Laboratory. Over the last 20 years he has designed and delivered electronics for interplanetary spacecraft including the ASIC designs for the Command and Data Handling subsystem for the Casinni Spacecraft mission to Saturn, and the Robot Arm Electronics for the Mars Phoenix Lander. He has worked on a number of research robot projects including a low power, low mass "nanorover" for asteroid missions and on getting sommercial electronics systems to work at liquid nitrogen temperatures. He has a patent for his work on a RISC based reprogrammable multi-chip module, and is currently the Cognizant Engineer for the Mars Science Laboratory Rover communications link and science interface electronics. Optimization Techniques Professor Dragos Arotaritei is member of Faculty of Medicine, UMF “Gr. T. Popa”, and Iasi. His research interest encompass from soft computing applications, fuzzy and hybrid neurofuzzy control, robotics to software engineering, optimization, problems and very large scale problems. Professor Tughrul Arslan holds the Chair of Integrated Electronic Systems in the School of Engineering and Electronics in the University of Edinburgh and is also a co-founder and the Chief Technical Officer of SpiralGateway Ltd. He is a member of the Integrated Micro and Nano Systems (IMNS) Institute and Leads the System Level Integration group (SLIg) in the University. His research interests include: low power system design, integrated micro and nano systems, secure and long life wireless sensor networks, autonomous systems, System-On-Chip (SoC) Architectures, Evolvable intelligent systems, Multi-objective optimisation, and studying autonomous self-adaptive behaviour in general. He has published more than 300 articles and is the inventor of a number of patents in these areas. A native of Iasi, Romania, Dr. Adrian Stoica is a Senior Research Scientist at NASA-JPL, California Institute of Technology and Visiting Professor at University of Edinburgh, UK. At NASA-JPL Stoica manages the Advanced Robotic Controls Group.He has over twenty years of R&D experience in autonomous systems, developing/embedding adaptive, learning and evolvable hardware techniques into electronics and intelligent information systems, for applications ranging from measurement equipment to space avionics to robotics. Dr Stoica PhD thesis in 1995 ("Motion learning by robot apprentices", VUT Melbourne, Australia) was one of the earliest works in humanoid robot learning by imitation. He has also been one of the pioneers and leading researchers in in evolvable hardware. He has lead a variety of research projects for NASA, DARPA, USAF, DTAO, BMDO, etc., developing new technology solutions in areas ranging from evolvable hardware for survivable systems to humanoid robots for planetary surface operations. He recently proposed 'shadow biometrics' a concept that opens a new field by allowing 'above the head' (e.g.aerial) biometrics. He has founded four conferences, has published over 100 papers, has several patents and keynotes,is member of various editorial and advisory boards, including the EU-ICS, FET ISTAG. Publicado por Unknown en 3/21/2009 01:09:00 p. m.